Sandy Allen’s outlook matches her license plate in all things, proving that age is just a number. 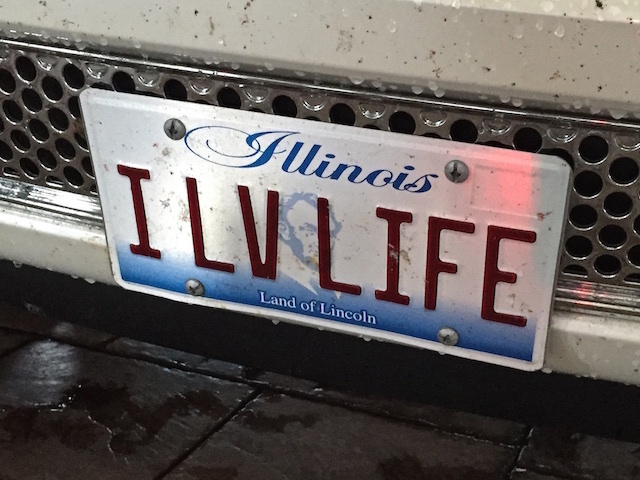 Sandy Allen’s license plate sums up her personality in just 7 letters. At 74 years young, she’s not looking to slow down. She is determined to take in every moment with gusto. It’s why this vivacious grandma raised her number time and again to bid on a once-in-a-lifetime hunt with Smith & Wesson’s president and CEO, James Debney, at the live auction at last year’s NRA Annual Meeting Women’s Leadership Luncheon. Sandy did not win the bid. It went to Susan J. Hayes, a classically trained chef, sommelier, wife, mother and grandmother. 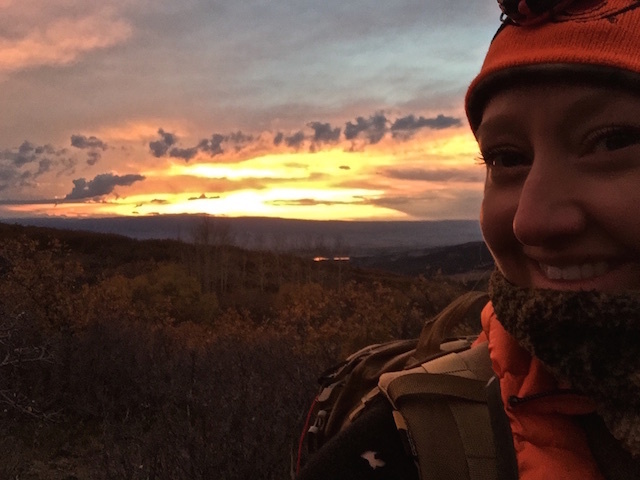 An avid hunter, NRA Foundation trustee and member of the Women’s Leadership Forum’s executive committee, Susan secured her spot for the 10-day elk, mule deer, and bear hunt with Colorado Mountain Adventures and Thompson/Center. With true “but wait, there’s more” flair, S&W’s CEO offered Sandy the chance to match the bid and join 6 other hunters and industry representatives, including T/C brand manager Danielle Sanville and yours truly. The before shot. 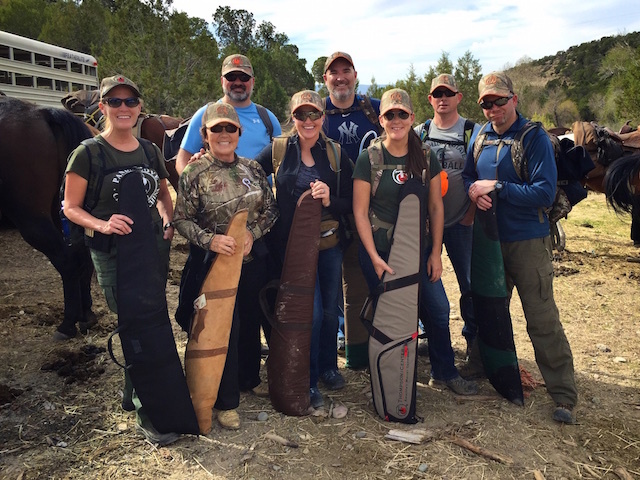 Smith & Wesson executives, influential NRA women, Thompson/Center execs, and other firearm industry representatives get ready to head up to pack out with Colorado Mountain Adventures. As a former resident of Montana, I’ve hunted elk a few times, but never successfully. Nor have I been so fortunate to go on a guided elk hunt. To say I was excited to have an opportunity to test my T/C Venture rifle in .308 with Federal Premium Vital Shok in Colorado is an understatement. 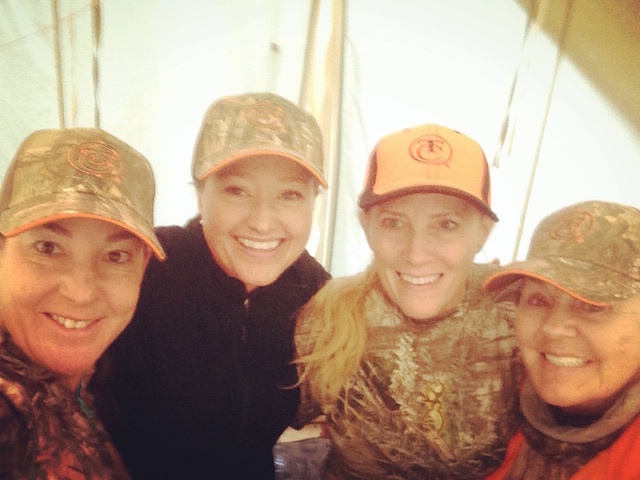 To hunt with other women? That put me over the moon. Final preparations: Guide Jordan Cook looks on as Susan Hayes confirms her zero. 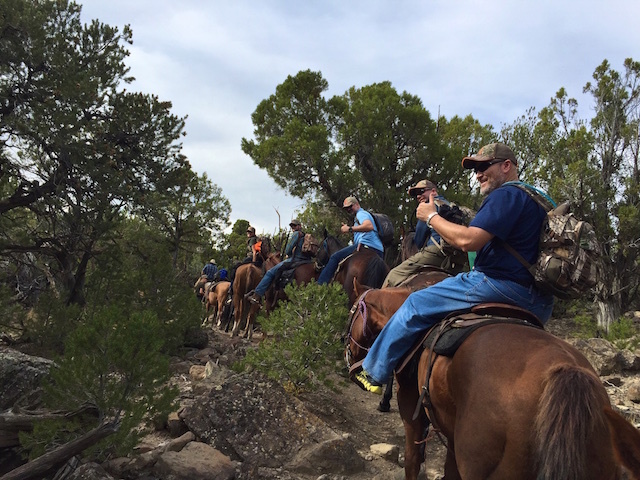 The hunt started out with a breathtaking 8-mile horseback ride up the mountain…for most of us. Susan quickly established her toughness and tremendous endurance by opting to walk to our base camp! All saddled up! I snapped this photo of our group heading up the mountain. Upon arrival we discovered that we ladies had our own cozy and private wall tent with cots and a wood stove. After a tasty meal courtesy of John, the camp cook, and laughter around the campfire, we snuggled into warm sleeping bags, ready for a predawn wake-up. Our home away from home, base camp provided all the necessities for our weeklong stay. There’s a saying about the weather in Colorado: If you don’t like it, just wait 5 minutes. Indeed, Mother Nature gave us the full range of conditions, from warm, sunny days to wet drizzle, thunderstorms, hail, and yes, even snow. 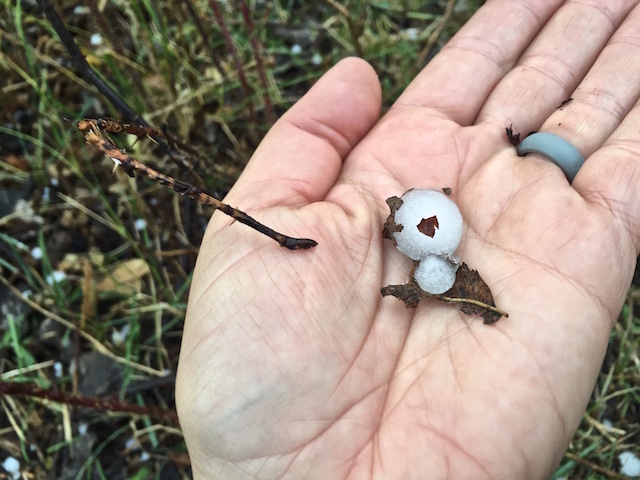 Remnants of an evening thunderstorm with substantial hail lasted through much of morning midweek. Although uncomfortable at times, the dynamic weather made for some spectacular photos and video. One of my favorites photos is a double rainbow peeking through the aspens. There is such beauty in nature! After a brief rainstorm, a double rainbow spanned the sky over a grove of aspens. What about the game? A few of us saw those unmistakable tines stretching to the sky and heard the piercing scream of a bull elk rise from the oak brush. There were cows, calves, and small mule deer, too. My hunting partner, Danielle, and I, along with our guide, Dan, and his loyal pup, Samantha, watched an enormous dark chocolate sow weaving in and out of the undergrowth like a gorilla. She was followed by a smaller blonde bear and two young cubs. There were other games, too! An entertaining card game called 99 kept the laughter coming. Horse wrangler Trent challenged me to double solitaire; he easily crushed me. Afterward I realized I should have challenged him to a shooting contest. Guide Dan Harrison glasses for elk while Thompson/Center brand manager Danielle Sanville watches a nearby ridge. 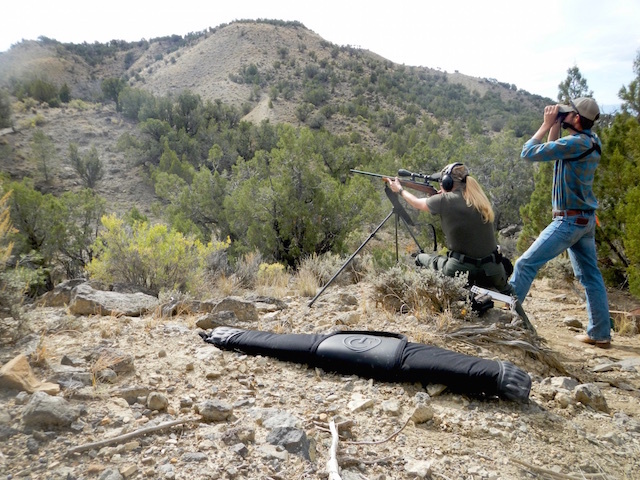 For me, the entire experience was exactly what I needed after a full season of shooting film and ammo. Although I dreamed of taking my first bull, with all the field-to-fork recipes racing through my head, I found so much more. I let go. The e-mails, the work calls, the social-media interactions, all went on hold. Soaking it all in! From rainbows to brilliant blue skies to spectacular sunsets, Colorado did not disappoint. I spent my time listening and laughing. A relatively new hunter, Danielle has a passion to learn and a daring attitude that motivated me. Sandy’s funny stories and jaw-dropping life experiences made me smile and feel humble and hopeful, all at the same time. I felt like a sponge as I learned from Susan’s efficiency and her vast knowledge of food, travel, parenting, and more. All this, combined with her perpetually joyful outlook, inspired me. A final fun “selfie” on the mountain. These women are so inspiring! 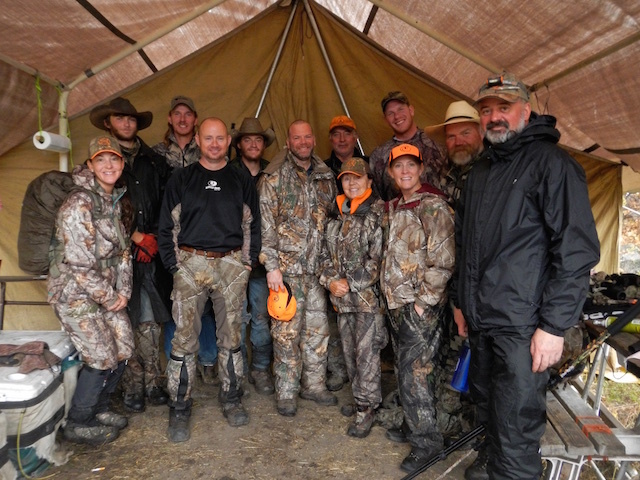 Smith & Wesson’s top executive, James Debney, and vice president and general counsel, Rob Cicero, kept us laughing and demonstrated the company’s passion for hunting and the outdoors. S&W’s director of channel marketing, Dustin Butler, was a joy to be around, with his kindness and easy smile. Colorado Mountain Adventure’s owner Jordan Cook and head guide Dan Harrison—along with Matt, Tim, Ron, Chandler, Trent, and John—made our experience one that none of us will ever forget. Our smiling after photo sums up our incredible experience with Thompson/Center and Colorado Mountain Adventures.